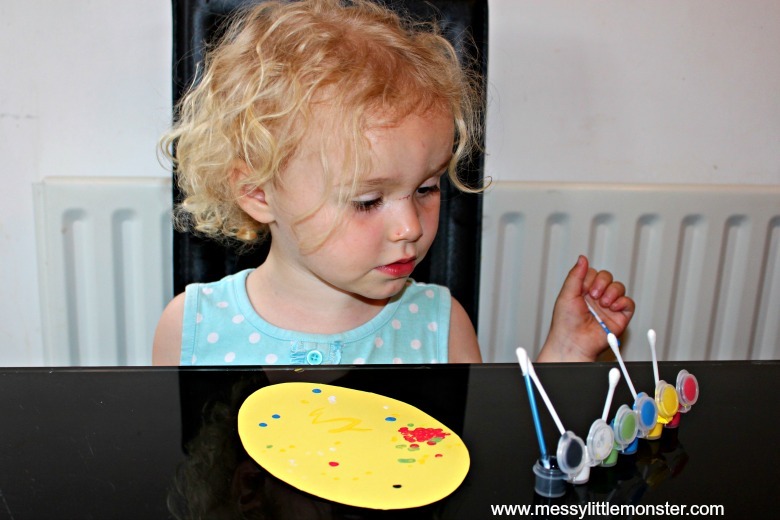 Q- Tip or cotton bud painting is such an easy painting idea to try with your toddler or preschooler. 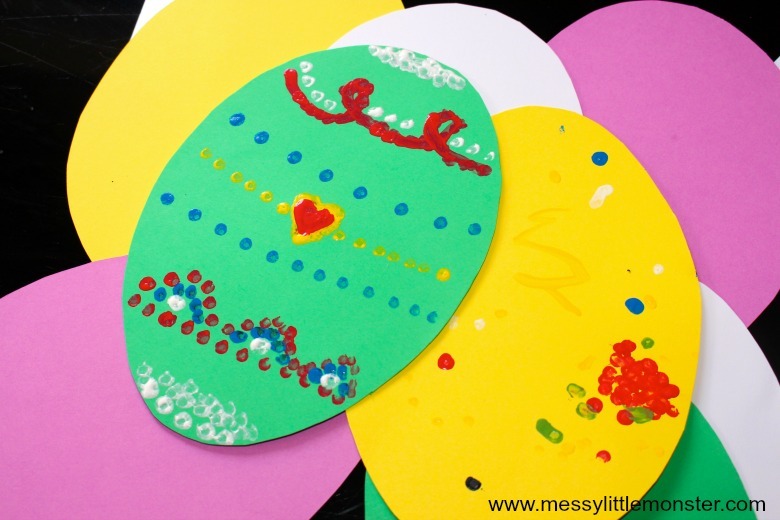 As we head towards Spring and start thinking about Easter why not encourage your child to decorate some Easter egg shapes using this fun technique. 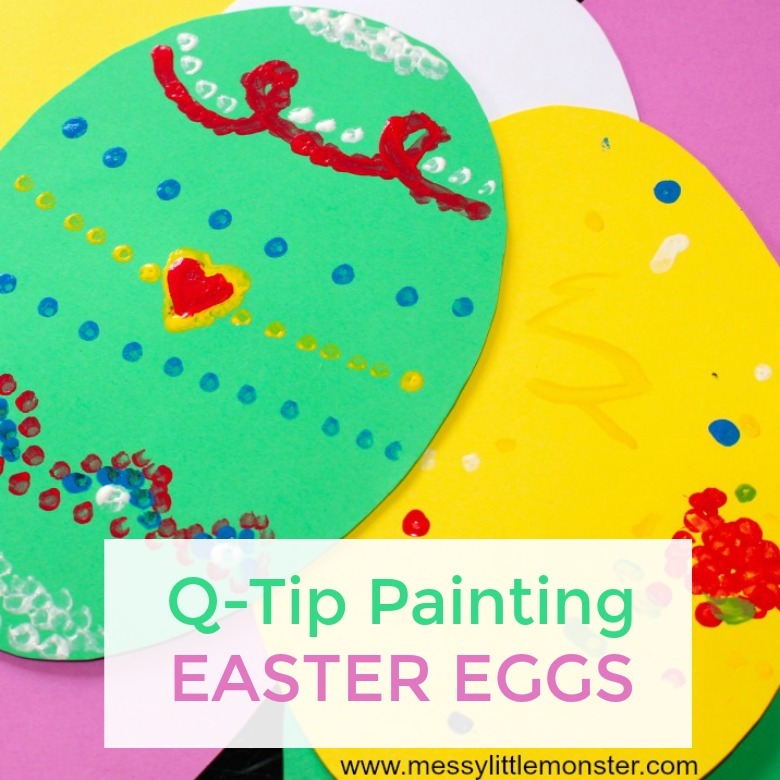 You could turn the decorated eggs into greeting cards or make a whole collection of painted eggs to create an Easter garland. See our collection of 20 Easter crafts and activities. We love experimenting with different painting techniques. If you have any spare Q-Tips left after doing this craft try painting on foil with them. We had lots of fun when we painted on foil in the style of Van Gogh. Another fun painting technique to try is to paint with marbles or water beads in a container like we did for our bunny art. You could also try painting with a pom pom attached to a clothes peg like we did when creating our DIY tote bag. 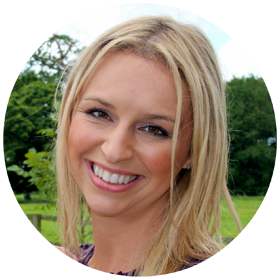 If you are feeling inspired to try more Easter activities after making these Easter eggs take a look at all our Easter crafts and activities. 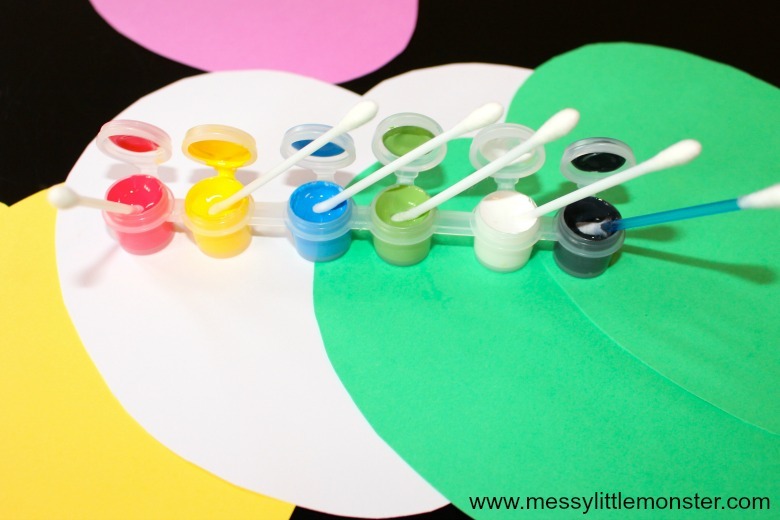 To set this activity up for your child cut coloured card into egg shapes and dip Q-Tips into pots of paint. You will need one Q-Tip for each paint colour. 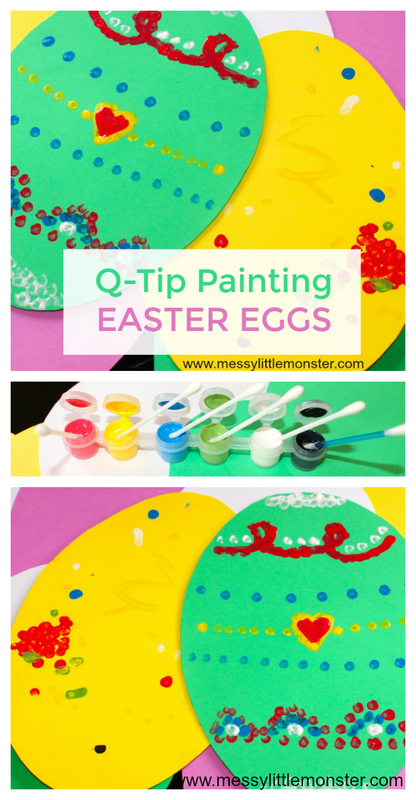 Invite your child to use the Q-Tips dipped into paint to make marks on their egg shape. 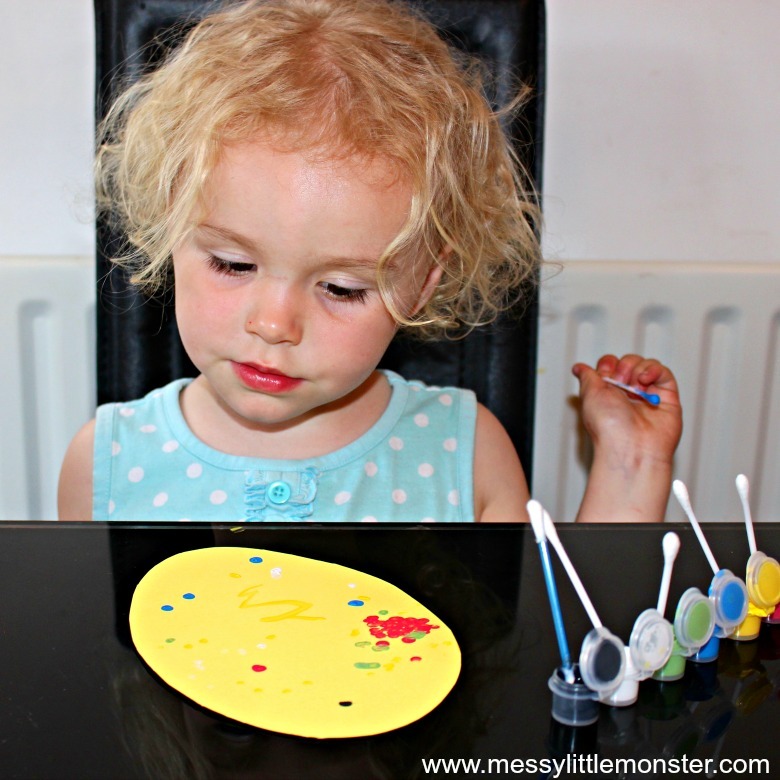 Toddlers and preschoolers can work on early mark making skills as they enjoy experimenting with using Q-Tips as an alternative to a paint brush. They can try making dots and lines and introduce as many colours as they choose. 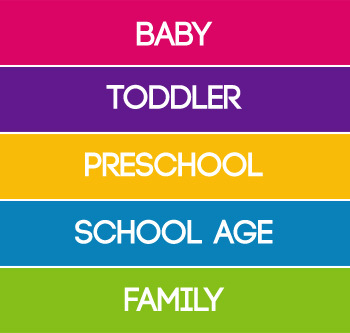 Older children could create a more complicated design or try creating some repeating patterns. The best part of this activity is that there is no right or wrong, whatever your child does it will look fantastic. They can enjoy the process and be proud of the artwork that they create. 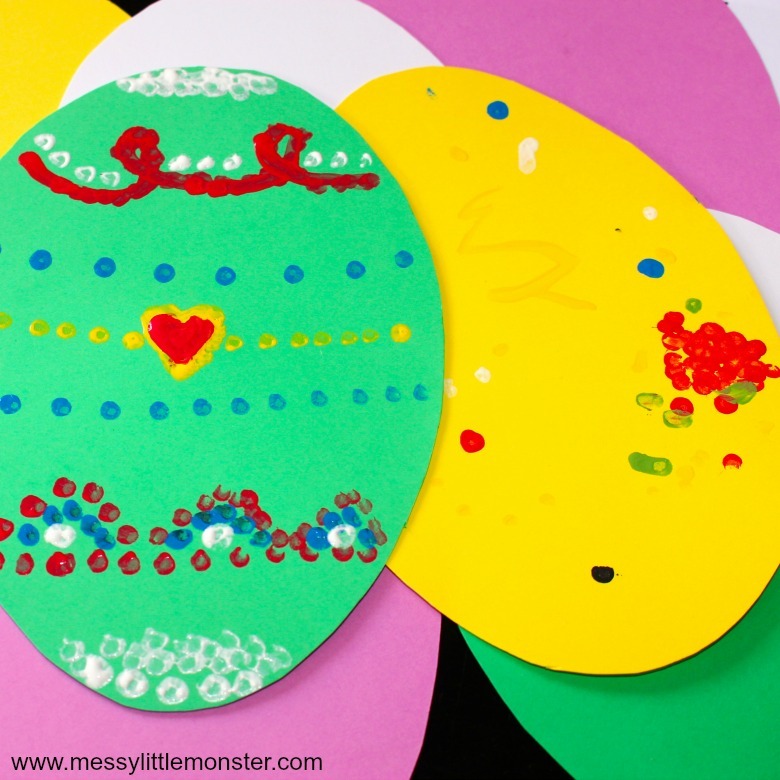 Did your toddler or preschooler enjoy this Easter art activity? Take a look at all our Easter activities for more inspiration.